Southport residents were in for a treat last night, as their favourite street busker took to the stage at Southport Theatre, only four months after she started busking. Singer Gypsy has captured the town's heart with her amazing voice, singing Opera aries in every weather on Southport's busy and windy streets. Residents showed her how much they love and appreciate her, by filling the theatre to maximum capacity for her very first concert. Starting with "I am what I am", Gypsy set the tone for the night. Everyone who was expecting her to sing solely Opera was in for a shock, especially once she picked up the pace with "Rockin' all over the world" and Dusty Springfield songs. Note-perfect on such aries like Mimi's from La Bohème, Gypsy also covered a lot of well-known musical songs, ranging from My Fair Lady's "I could have danced all night" to Cat's "Memory". Andrew Lloyd Weber, watch out! During technical glitches, Gypsy showed how professional she really is. When the technicians played the wrong intro for the fourth time, she joked, commented on it in her down-to-earth way and got on with the show, taking it in her stride. However, she might have been serious when she joked "I should have just used my boogie box instead!" It is one thing for a street busker to get people to stop, listen, and maybe throw some money in the hat. It is another story entirely, to get a whole town to come along, and get the audience to sing along to "The wonder of you" and even Bon Jovi's "Livin' on a prayer." Gypsy had her audience raving and asking for more, but the fame did not go to her head. Today, she is back out there on the street busking, singing along to her boogie box, and making Southport's streets just a little bit brighter. Dieser Artikel ist auf Karl. im Solinger Tageblatt erschienen. Wer „Deutsches Rotes Kreuz“ hört, denkt wahrscheinlich zuerst an Rettungswagen, Sanitäter und Erste-Hilfe-Lehrgänge. Doch neben Sanitäter-Ausbildung und Bootsführerschein bietet das DRK Solingens Jugendlichen eine Menge Spaß und Action. Das Gleiche gilt auch für den Malteser Hilfsdienst und das Technische Hilfswerk (s. unten). Die Freizeitfahrten im In- und Ausland sowie die Zeltlager und Ferienkolonien sind sogar für Nicht-Mitglieder offen und immer lustig. „Wir sind mit den Zielen flexibel – ob Spanien, Frankreich oder Peru, der Spaß steht dabei an erster Stelle. Das ist auf keinen Fall ein Erste-Hilfe-Lehrgang, der auf Zeltlager getrimmt ist“, betont Sascha. Auch der Schülerpraktikant Gianluca Vollmann (16) hat sich die Stelle beim Jugendrotkreuz eher wegen der Jugendarbeit als dem Sanitätsdienst ausgesucht. „Mir gefällt es hier sehr gut, und wenn’s so weiterläuft, bleibe ich hier auf jeden Fall aktiv.“„Beim Jugendrotkreuz können sich die, die sich für Berufe im Rettungsdienst interessieren, ausbilden lassen. Von der ,Jugendleitercard JuLeiCa’ über Streitschlichter und Schulsanitätsdienst bis zur Ausbildung zum Rettungssanitäter kann man alles bei uns lernen“, erzählt Sascha. „Durch den Schulsanitätsdienst zum Beispiel wird man Ersthelfer, Menschen zu helfen und Leben zu retten, ist eine große Verantwortung.“Diese Ausbildungen beim Jugendrotkreuz sind also Qualifikationen fürs Leben. Und ehrenamtliches Engagement zahlt sich aus. „Was ich sehr interessant finde, ist die Wasserwacht. Da kann man sich zum Rettungsschwimmer, Wettkampfschwimmer oder Taucher ausbilden lassen und den Bootsführerschein machen“, sagt Sascha, der Jahrespraktikant beim DJRK ist. Dabei macht man dann auch Fahrten ans Meer und hält an der Nordsee und Ostsee Strandwache. Ordinary objects like bouncy balls and bananas become art in the Recent Relics exhibition at Southport’s R Gallery. The show, which features art and installations from four local artists, makes you think twice about some things many of us would discard of as waste. Whether it’s the colourful Pop Art potential or the thought-provoking installation you’re after, Recent Relics has it all. The centre-piece of this show is a horse’s skull mounted on metal, which rocks back and forth. Although I as a horse lover personally find the installation a little morbid, the rocking motion of the metal does make you think of the horse still cantering on. A little closer to home for most locals will be the Sea Shell installation, which contains painted common cockle in a variety of bright colours, mounted on the frame of a stained-glass window. Bouncy balls brought back all the way from India almost create the effect as if they could be the glowing light bulbs surrounding a dressing room mirror. Bottles and cans are used and thrown away by most of us every day. However, keep the bottoms, paint the cans and fill the bottles with beads, buttons and candy, and you could end up with the simple yet brilliant ideas for two Art installations in the Recent Relics show. My favourite exhibit is the banana emergency box though. Instead of breaking the glass in case of a fire to turn on the alarm, you are advised to eat the banana inside the box in case your blood sugar levels are low. Recent Relics is on show at the R Gallery, 157 Eastbank Street, until February 10 and some of the work exhibited has been shortlisted by the Liverpool Chamber of Commerce for the Environmental Art Awards. The gallery is open every day from 10am to 5pm. It took us the best part of 2 1/2 to 3 hours, but it was worth it. Our little Renault 5 is finally clean again!! We got the car in a very dirty, filthy state - grime everywhere, hairs of some sort all over the upholstery, dirt, dust, gravel and even hay all over the interior. An alle deutschen Nachwuchsjournalisten unter 24: Der LBS Preis für Nachwuchsjournalisten nimmt noch bis 28. Februar Einträge entgegen! Du schreibst für eine Schülerzeitung? Arbeitest in einer Jugendredaktion mit? Oder hast ein paar Artikel bei einem Praktikum veröffentlicht? Oder du schreibst gerne über Themen die dich interessieren aber du hast sie noch nicht veröffentlicht? Dann kannst du mitmachen und gewinnen! Es winken ein 3-tägiges Journalisten-Coaching, sowie ein Apple Mac, ein iPhone und eine Digitalkamera für die ersten 3. Wie du am LBS Wegweiser Journalistenpreis teilnehmen kannst, erfährst du hier. I was notified about a complaint today, that the Solinger Tageblatt received because of my portfolio website cornelia-kaufmann.jimdo.com. Mr. G. had been to the Tageblatt office on Friday to complain, and from what I've heard, he was not very well-spoken and not the quietest either. I had written an article for the Tageblatt, which was published on 9th October 2008, in which he and his wife get a mention. After all, it was them who alerted us to the problem and basically commissioned the article. I had used that article as part of my portfolio website, on which I collected all my articles until early 2009. Their complaint was now, that although you can also find the article on the Solinger Tageblatt Homepage, it shouldn't have been on my site. "It's not right to find my name mentioned on the internet", Mrs. G. told me on the phone. They said they hadn't given permission to me to use it - thing is though, technically, they had. They had given permission to the Tageblatt, which I write for. However: First of all, I stated on my site, where the article originated, that I had written it and why I used it on my site (as part of my portfolio). Also, my website has a link to the Tageblatt homepage. So it was properly referenced. But here's the thing: If somebody wants to republish or use a Tageblatt article in any shape or form, not the persons in the article have to give permission - just the author of the article. And in this case, the author is me! So if I decide to publish my article on my website I am in my right to do so! Besides, you could only find my site if you knew the address, and you could only find that specific article on the site if Mr. G. went on an ego trip and googled himself. Which I assume he did, how else would he have found it? I reluctantly deleted the article from my website, but I just got word from the Tageblatt's secretary that he was back in the office Tuesday (19th January) to complain some more, even though I had called them and deleted the article. Welcome to the internet age, is all I can really say to that. Oh yeah, and: "Mr. and Mrs. G., get a life!" What do you think? Leave a comment on the blog to let me know! 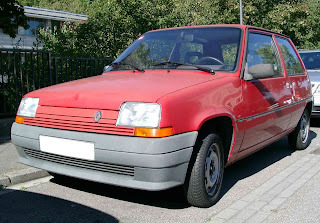 Just as my other half and I had decided not to buy a cheap Nissan Micra that had been offered to us, on the grounds of not really being able to afford it, this offer came up: A 1995 red Renault 5, manual for GBP 100. How could we say no? I haven't driven a manual car, let alone on the wrong side of the road, in quite a while, so getting behind the wheel of our new car was a weird sensation. And I never thought that reverse gear and I could ever be friends, but we seem to have called a truce. It's still got a cassette deck though, which I find is kinda cute. The picture above is not the actual car we bought - as you can see, the steering wheel is on the wrong side for Britain - but it is the kind of car we just got. For that little money, I wasn't expecting a lot. But the car is in good shape, starts everytime, sounds good engine-wise and handles nicely. It does need an awful lot of cleaning though! The side mirrors are covered in a thin layer of moss. There are cobwebs on the sun visors, dust settled in every little crack and covers the dashboard and the floor doesn't seem to have seen a vacuum cleaner in years - gravel, dirt and even some screws can be found underneath every seat. The dashboard is stained and there's white paint on the backseat and one of the hooks to keep the shelf in the boot in place has been broken off. Oh yeah, and the passenger seat belt is way too short for some reason. But really, all it needs is some strong chemical cleaners and a day devoted to it, to make it look shiny again. I will post some before / after pictures at some point, so that you can then judge for yourselves! It's a good little car, and I can't wait to take it round Britain!